The first of my runs this weekend was following the second leg of the St Peter's Way ultra race that I'll be running in February. I was with the RD of the race, Lindley, and Nigel who's also going to be running the main event, and the idea was that we'd follow the route instructions that Lindley's written, to check they made sense. We met at 9am on Saturday morning, with an inch or so of snow on the ground, and made our way our round a beautiful route through the fields and country lanes. The St Peter's Way is a centuries old pilgrimage route across Essex, and the ultra is going to be about 45 miles in total. It's going to be hard going - it's ploughed fields, there's likely to be lots of mud on the day (it was all frozen and covering in snow on Saturday) and it's over stiles and through gates, but the hardest part is definitely going to be the navigation. I'm very glad I did the recce run, as I now have a bit more of idea of how to make it work and I have more confidence for the race - the instructions on the route description do make sense if you pay attention but you just have to follow them carefully. It's about reading one at a time, running to the next instruction, and then checking again. I've definitely accepted that this race isn't going to be about getting any sort of time - it will just be about getting through the miles and trying to finish each leg before the cutoff (total cut-off for the whole route is 13 hours). I'm really looking forward to it though as it's going to be a great challenge, and I'll be so proud of myself if (when!) I actually finish. The medal is lovely too - Lindley brought it with him to show me as I'd made a bit of a fuss about not getting a medal for the Stort30 which was the last race he put on. 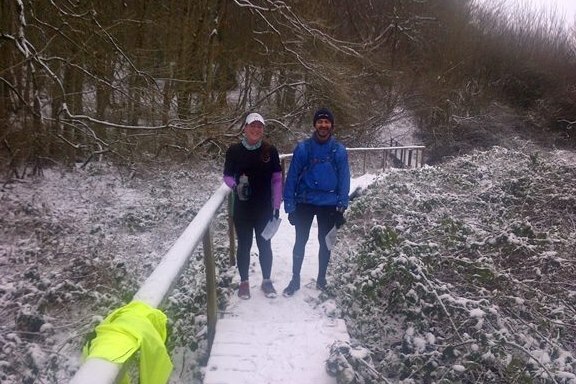 After we'd got to where the second checkpoint of the race will be, we parted ways and I ran home to Billericay, taking a route through the lanes rather than cross country, but it was still really pretty through the snow. In the end, I clocked up 8 miles with the guys (which was lovely not only because of the route but also the company - great to run with people rather than on my own for a change!) and 13 miles in total for the day. On Sunday, I headed out again - it had snowed all night, and was snowing all day, and so we had a lot more of the white stuff than we did on Saturday, by the time I headed out at 2.30pm. It was a bit slippery and dangerous on the pavements where the snow had started to become compacted by people walking on it. I only have road shoes which don't have the best grip and so took it slowly and carefully, but once I got to the woods and after that the country lanes, it was amazing - very few people had been out, and the snow was quite deep. It was hard work but absolutely stunning through the woods - I wish I'd taken my camera with me, it felt magical. I'd started out with my iPod playing but soon took it off as just wanted to enjoy the stillness that had come with the winter wonderland I was running through. Absolutely stunning!! :D So, I got another 8 miles in, and thoroughly enjoyed myself. My calves are really tight and a bit painful at the moment, ever since running Windermere, so after stretching and rolling last night, I also had a bath to try and relax them, before the compression socks went on for the evening. This morning they're still a bit sore, and so will keep looking after them and hopefully they'll improve. My biggest worry though is that the beautiful snow will shortly turn to slush, and then ice, and tonight's run might have to be relocated to the gym and the dreadmill which will make my calves hurt even more. If they have any left in stock I'm going to try and buy some yaktracks at lunchtime, to try and salvage my outside runs.